Princeton University Press, 9780691175379, 200pp. For nearly three decades, English has been the lingua franca of cross-border organizations, yet studies on corporate language strategies and their importance for globalization have been scarce. In The Language of Global Success, Tsedal Neeley provides an in-depth look at a single organization--the high-tech giant Rakuten--in the five years following its English lingua franca mandate. Neeley's behind-the-scenes account explores how language shapes the ways in which employees who work in global organizations communicate and negotiate linguistic and cultural differences. Drawing on 650 interviews conducted across Rakuten's locations in Brazil, France, Germany, Indonesia, Japan, Taiwan, Thailand, and the United States, Neeley argues that an organization's lingua franca is the catalyst by which all employees become some kind of "expat"--someone detached from their mother tongue or home culture. Through her unfettered access to the inner workings of Rakuten, she reveals three distinct social groups: "linguistic expats," who live in their home country yet have to give up their native language in the workplace; "cultural expats," or native speakers of the lingua franca, who struggle with organizational values that are more easily transmitted after language barriers are removed; and finally "linguistic-cultural expats," who, while native to neither the lingua franca nor the organization's home culture, surprisingly have the easiest time adjusting to language changes. Neeley demonstrates that language can serve as the conduit for an unfamiliar culture, often in unexpected ways, and that there are lessons to be learned for all global companies as they confront language and culture challenges. 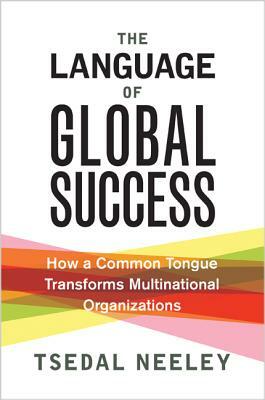 Examining the strategic use of language by one international corporation, The Language of Global Success uncovers how all organizations might integrate language effectively to tap into the promise of globalization. Tsedal Neeley is an associate professor in the Organizational Behavior Unit at Harvard Business School.